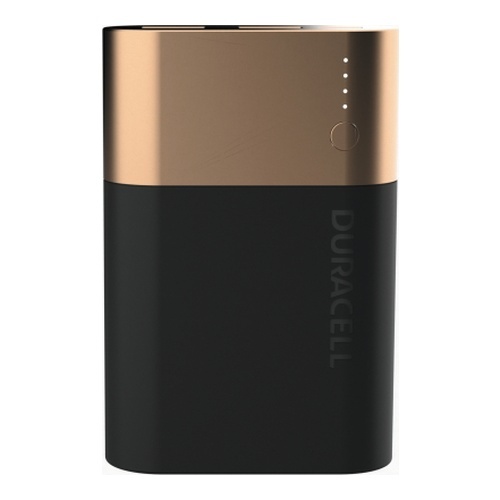 Duracell Rechargeable Powerbank 10050 mAh is a reliable source of power that frees you from the wall and lets you keep your devices charged everywhere you go. This high capacity power bank is designed to provide multiple charges and up to 72 hours extra of talk or surf time* for one or two devices thanks to 2 output ports, making it a great back-up solution for longer journeys, business trips and all those moments when you don’t have access to power outlets. Thanks to the dual charge technology, you can simultaneously charge both the power bank and your device. Plus, with the LED indication, you can always check how much energy is left. With Duracell’s 3-year guarantee and 10 safety features, you can go about your day with full power and no worries. * Hours of time and number of charges are estimated by comparing the iPhone® 7 internal battery specification on apple.com to the internal battery of Duracell Powerbank. Results will vary by device and conditions. Duracell Powerbank 10050 mAh, Fast Charge External Battery Pack for Smartphones and USB-Powered Devices, Compatible with iPhone, Samsung.